There are six candidates to choose from for Iran’s first new president in eight years. While critics say the ballot won’t be free and fair, the very manner in which Iranian people vote differs significantly from what Westerners are used to. "It is possible that some people, for whatever reason, do not want to support the Islamic Republic’s establishment, but they do want to support their country. They should also come to the polls. Everyone should come to the polls," Khamenei said in a speech on Wednesday, reported on his website. The winner in the 11th presidential election since Iran's 1979 Islamic Revolution will replace the current president Mahmoud Ahmadinejad, who is not eligible to run for a third term. Among the problems to tackle will be high unemployment and inflation, as well as international sanctions imposed over Iran's disputed nuclear program. “We started presidential elections three decades ago, we had a monarchy in Iran. So it’s all new. We are learning and trying to make everything better and better every year,” Mohammad Reza Nematzadeh, campaign director of one of the presidential hopefuls Hasan Rouhani, told RT. Saeed Jalili, 47, from the Front of Islamic Revolution Stability in considered the favorite in the election. The candidate, who holds middle ground between conservative and reformist vies, has been Iran’s chief nuclear negotiator since 2007. Ali Akbar Velayati, 67, represents the conservative Islamic Coalition Party and considered to be Jalili’s main rival in the race. He used to be a Minister of Foreign Affairs, and now he’s the foreign affairs advisor to the Supreme Leader of Iran. Mohammad Bagher Ghalibaf, 51, runs from the Islamic Society of Engineers. The former military now occupies the position of Tehran’s mayor since 2005, standing on conservative positions. He was also a candidate in the 2005 presidential election. A number of people on the streets of Tehran told RT they are proud of the upcoming elections, regardless of their outcome. “No Islamic State, not Saudi Arabia nor Kuwait would ever have elections like we have. In those countries it’s more like someone has appointed them to a post,” said one local. Some Iranians complain they are simply tired of ‘conventional politics’, however. “Politicians become more and more distanced from the people. The gap is wider and wider. And whole elections look more and more like an appointment. 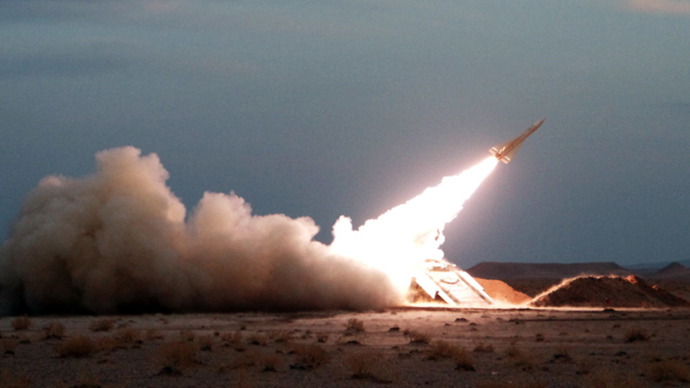 This is why I will not vote,” another Iranian remarked. Others may fear going to vote because of possible violence. Mass protests that followed the 2009 disputed elections are still fresh in the memories of people when between 30 and 70 people were killed, hundreds others injured, and thousands arrested during the unrest in what became the worst domestic unrest since the 1979 Islamic Revolution. Iranians staged rallies calling into question Ahmadinejad’s ‘sweeping victory’ with a majority of 60 percent. Six hundred and seventy-eight people registered as candidates have been barred from standing in the election on June 14, giving rise to criticism from the West. Mohsen Rezae, 58, from the Moderation and Development Party is taking part in his third presidential election. The Secretary of the Expediency Discernment Council, who’s also a conservative, is wanted by Argentina in connection with a 1994 suicide bombing of a Jewish cultural center in Buenos-Aires. Hassan Rouhani, 64, from the Association of Combatant Clerics is going to challenge the conservative forces in the election. The united candidate from the reformists has been heading the Center for Strategic Research for more than 20 years. The Iranian presidential vote itself may seem somewhat different to the Western eye, in terms of election campaigns and tactics, as RT’s Maria Finoshina reports from the Iranian capital. “If people see a campaign poster, they’ll start thinking ‘they spend lots of money on that! Where does it all come from?’ And they will draw the conclusion that someone - a bank or an organization - funds the candidate. This means that when a candidate takes power, he will have to give back the money, he will owe them. And with such strings attached, he’ll never be free. People will never vote for a politician like that,” Reza Moghadasi, from news agency MEHR, told RT. 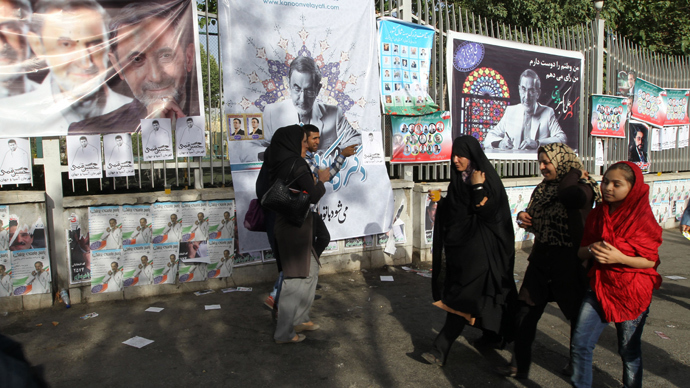 Therefore, you won’t see numerous banners or posters scatted across Iran ahead of the country’s 11th presidential vote, but not because they have been banned. Candidates prefer to run low-cost grass-roots campaigns, with their supporters handing out fliers on the streets, advertising different political programs. Candidates these days also seek alternative support among Iranian internet users. “Twelve million people are now using the internet. It is much easier to communicate with them. But the people in more rural areas, we need more trying to get to them, this is our weak point,” Mohammad Reza Nematzadeh said. The golden rule is not to go against the norms and traditions deep-rooted in the Iranian society. The fact remains that key Iranian policies, such as its controversial uranium enrichment program and Iran's support for Syrian President Bashar Assad, are still decided by one person, Iran's Supreme Leader Khamenei. “A candidate cannot go against our religious or cultural traditions; you cannot change the way women wear hijabs. And as for taboos on foreign policy issues - you cannot come out and say, ‘Iran will become a friend of the US or Israel’,” director of newspaper Mohamed Pirali explained. Pirali says these restrictions are aimed at protecting the national character of the elections. “You cannot go against values, even democratic countries can’t do that… but perhaps if we weren’t under so much pressure from foreign countries that only want to change the government of Iran our campaign could be different,” he added. The president of Iran is elected for a four-year term. If no candidate rakes in 50 per cent of the ballots cast in the first round, a runoff vote will be held in two weeks, on June 21. In the second round, the candidate with the most votes will become the winner and will take office after approval by the Guardian Council.